But women are still underrepresented as a proportion of all congressional candidates and nominees, with significant disparities by party. Much attention has been paid to both the surge and success of Democratic women candidates in 2018. In U.S. House primary contests, Democratic women candidates had the highest win rates of any group, both among all candidates and among non-incumbents only. 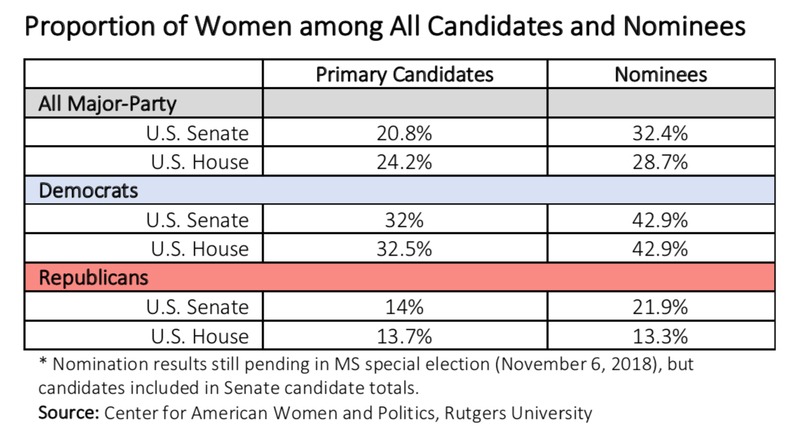 Importantly, however, Democratic women nominees for the House are more likely than their male counterparts to be running as challengers in November. 50% of women nominees, and 36% of men nominees, are running as challengers in November. Among Democrats, 52% of women nominees and 39% of men nominees will challenge incumbents in November. 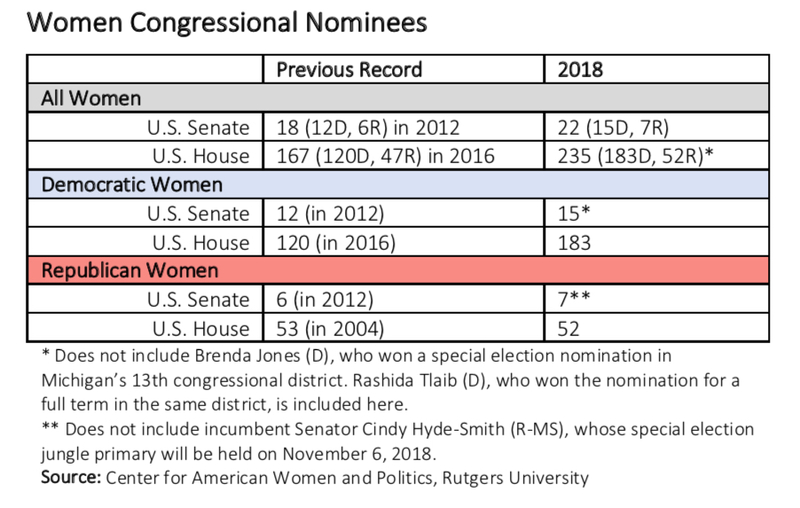 Women are favored to gain representation in the U.S. House based on current race forecasts, but are very likely to remain underrepresented among all officeholders next year. If women won all House contests in which they are currently favored as well as those races deemed toss-ups, they would hold about 24% of House seats in 2019. Currently, women are 19.3% of House members. Women of color are more than one-third of women House candidates and nominees, but just one woman of color will be a Senate nominee this November. Many women of color congressional candidates are poised to make history this year. Deb Haaland (D) of New Mexico is likely to become the first Native American woman in the U.S. Congress. Sharice Davids (D), in a more challenging race in Kansas' 3rd congressional district, could join her. Michigan's Rashida Tlaib (D) and Minnesota's Ilhan Omar (D) are set to become the first Muslim-American women in Congress. Omar, who is Somali-American, would also become the first woman of color to represent her state in Congress. Two more Black women, Jahana Hayes (D-CT) and Ayanna Pressley (D-MA), are also likely to be the first women of color in their states' congressional delegations. In Texas, two of four Latina nominees - Veronica Escobar (D) and Sylvia Garcia (D) - are favored to win in November; they will be the first Latinas to represent Texas in Congress. Marsha Blackburn is the first woman to be nominated by the Republican party of Tennessee in a Senate race, and, if she wins in November, she will become the state's first woman senator. If elected in November, current Senator Cindy Hyde-Smith (R) will become the first woman elected to Congress from Mississippi. Pennsylvania, the largest state in the country that does not currently have a woman in its congressional delegation, will shed that dubious distinction this year, as both major-party nominees for the state's 5th congressional district, Pearl Kim (R) and Mary Gay Scanlon (D), are women. If Kim wins in November, she will also become the first woman of color to represent the state in Congress. In South Carolina, another one of 11 states with no women currently in Congress, Katie Arrington (R) - who defeated incumbent Mark Sanford in the primary - is currently favored to win in the 1st congressional district. South Dakota will lose its woman in Congress this year. Current Representative Kristi Noem (R) is the state's Republican nominee for governor. 1 In CA-45, two women will be on the ballot this fall, but Aja Brown (D) has withdrawn from the contest. That race is counted among the 33 women v. women contests, though Brown is not actively campaigning.